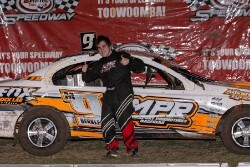 Joel Berkley won round 3 of the Toowoomba Steering & Suspension Club Championship Series on Saturday night, at the Hi-Tec Oils Raceway, Toowoomba. Berkley had a good battle throughout the night with Brody Fraser, with Fraser breaking the track record in the opening heat. The duo would start on the front row for the main event, with Berkley getting the best of the start, ultimately leading all the way. Fraser chased Berkley throughout, but Berkley would win by two car lengths, breaking the track record set by McGee earlier in the night, lowering the one lap time to 16.657. Thomas Fuller, Josh Arthur and Amy Evans rounded out the top five, before a handy crowd. For Berkley it was his seventh Feature Race win of the season, and his second win at Toowoomba, which has the Maryborough based driver, the highest ranked senior driver in Australia in terms of Feature Races won. Berkley will now focus on this weekends National Title at the Western Speedway, Hamilton, where he will be one of forty four drivers to take part. Last season on his home track, Berkley was the highest qualifier after the opening night, but an incident in his fourth heat, put the youngster behind the eightball on night two, with the event ultimately won by defending Champion Trevor Mills. Berkley was in his first season out of Junior Sedans and flew under the radar to some extents, that will not be the case this weekend, where Berkley will be one of the drivers to beat in the National Title.